Photo courtesy of Nicole Poitras The student group from Hollis Brookline High School smile for the camera during their recent trip to Spain. 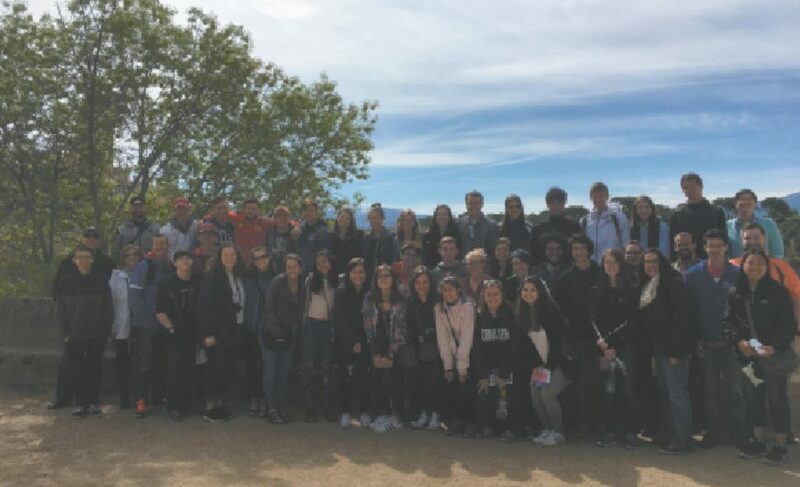 A group of 39 Hollis Brookline students accompanied by six chaperones, led by Spanish teacher Alex Basbas, recently returned from an educational and enlightening trip to Spain. The tour began in the bustling city of Madrid, where the students were able to explore the many city centers and shop to their hearts’ content. The next nine days would bring them south, where they encountered a multitude of incredible opportunities, from getting to observe sword makers in Toledo to walking through the breathtaking gardens of the Alhambra in Granada. All the while, the travelers were able to receive an in-depth education on the historic landmarks in Spanish history, along with Spain’s crucial involvement in the history of the United States. Of course, the greatest challenge of the trip was not just adjusting to the culture of Spain, but communicating with the locals. The group, consisting of students enrolled in all levels of Spanish at the high school, was frequently able to practice their Spanish-speaking skills with store owners, waiters and tour guides. Though long and exhausting, the trip was an unforgettable experience for many. The world travelers returned to the states with lifelong memories and a deeper appreciation for Spanish culture. This column is written by Nicole Poitras, a senior at Hollis Brookline High School. She was among 51 high school journalists representing all 50 states and Washington, D.C., who attended the Al Neuharth Free Spirit and Journalism Conference in Washington last June.